DutzWorks - Illustration and Graphic Design by Derrick Utz: My new project and where Kodi and your Captain are going! My new project and where Kodi and your Captain are going! 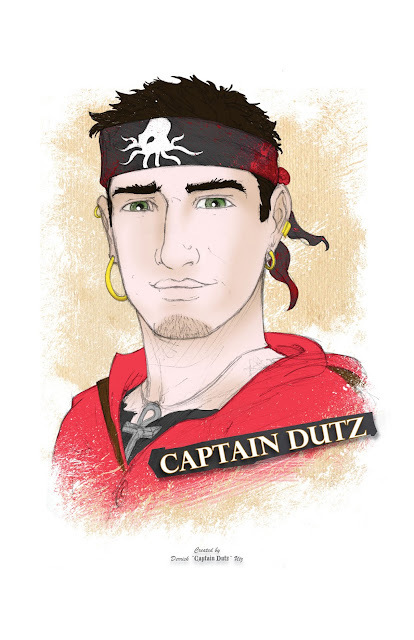 This is the newly updated Captain Dutz art! It will soon replace the illustration on the header of the blog! Ahoy there my dear fans, friends and family! Ok, for a long building update. I have been working on some new things lately to improve my processes and make progress on many fronts. There are two major things that have been on my front burners and I am finally at a point where I can discuss them with my fan base at large. I would also like to point to the new art at the top of the page! This is a new piece created for a special project, one I will discuss soon, and is the new Captain Dutz brand image. I just finished today and I hope you enjoy! As many of you know, I am a full time designer and create & illustrate my own personal projects on the side. This leaves me very little project time between work and a family time as a husband to an awesome woman and father to two magnificent children. Due to these restrictions I have to be efficient...I mean really efficient, especially since I suffer the same "distracted squirrel" complex that many artists have to deal with. It is a miracle at times if i even hit the computer or drawing table. This issue lead me to the first of the two projects in front of me. Being an illustrator, I have a limited knowledge of the craft of writing. Oh I can come up with an amazing story, but I have a problem with forging it into a story that does not seem like the reader is chasing another squirrel through the pages of a story. I know there are certain element that every good story needs and thanks to the awesome content of my favorite comics creation site, Paper Wings Podcast, and some amazing writing and artist friends, I have been developing something called the "Indie-Man's Toolkit." This is being worked on in a private group and is mostly finished now. It will contain checklists, organizational forms and layouts to plan key scenes, pages and covers for many different types of visual story telling. This is not to replace the craft of writing stories. That is an art to itself and cannot be replaced by forms and fill-in-the-blank sheets. Instead, this tool is to help the independent artist/illustrator with breaking down the pieces needed for writing their own stories. I plan on using this to help me be organized so that when I hit the drawing table; I have the story in a logical order, items/characters/places referenced and practiced and key scenes caught when they are fresh and awesome from my brain. I mighty task to itself. This leads into my second project. While developing this and communicating with the Paper Wings community in a recent blog with guest storyboard artist, Ryan Woodward, I was given some advice from one of the hosts, Lora Innes. I was given a great message from Lora concerning my stress about the workload of Kodi the Starfish, my independent children's story project. As I mentioned before, I do not have a huge amount of time available and the reason I started to develop the toolkit is because I started to realize how much work I had ahead of me just to even write Kodi's story, let alone draw/color and letter it. In the end, to do it right, I was looking at Kodi's story taking 3 to 5, (50) page books. Possibly. That is a lot of work and alot of art. That also meant that I would not look at having a finished book very soon and the story itself would take a very long time at that rate to even finish right. Lora suggested that I look at doing a project that I could finish sooner to both ride the wave of accomplishment and to have a finished product on the table sooner (a very important goal to me). This is one of the greatest changes I can make to my current workload. I have been under a huge weight when putting all of the factors of Kodi's story together and that is not doing him justice. I think it would be best to put him back in outer space for a time more to let him and myself grow some more. This means that I seriously do not want to drop Kodi's story completely, I just need to "wait until the most opportune moment." That moment, I believe, just isn't here quite yet. In the spirits of choosing a shorter term project, I have reached into my "Lightning Box (my version of catching lightning in a bottle)" and have pulled out what I think will be a great first, full-length finished project. It is called "Bot's Amusement Park" and will be one, self-contained book when finished. It will be about 50 pages in length, maybe shorter and will be a twist on the fully illustrated comics/graphic novels available to audiences today. In this form, I will be able to do one of the things I do best, high-quality line art that will integrate wonderfully into this style of story. I will explain more as I progress and will hopefully have a logo, pitch and concept art for you soon. First I need to finish the "Indie-Man's Toolkit," then I will use it to help me develop, plan and write Bot's Amusement Park correctly from the start. 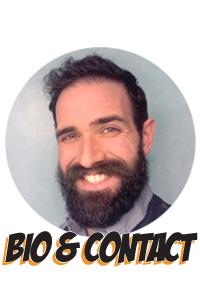 I am very excited about this because it will give me the opportunity to tell a complete story sooner and this story means a great deal to me. It is a heart-felt story about family and where that finds it's strength and growth. If you cannot tell, family means much to me and I long to tell stories that can hopefully strengthen others!